What comes out of the box isn’t surprising – one Aria phone, a one piece headset, a tiny charger, a microUSB cable and a bunch of manuals. You also get a 2GB microSD card with SD adaptor. 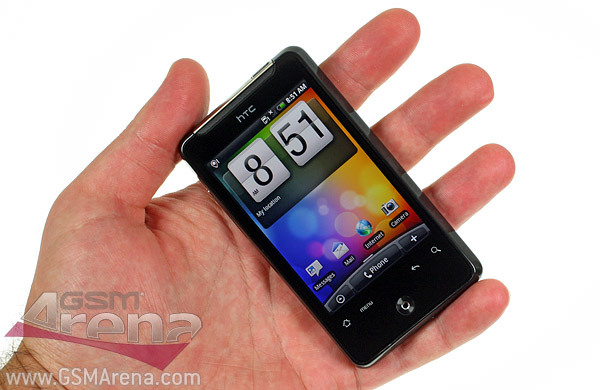 As for the HTC Aria itself, I’m having a deja vu – it looks almost exactly like the HD mini. OK, they swapped the Windows Mobile keys for Android ones and there’s an optical trackpad, but other than that both phones are the same. The specs of the Aria are the same too – 3.2” HVGA capacitive touchscreen, 600MHz CPU, 384MB RAM, 5MP camera with VGA@30fps, GPS, Wi-Fi and so on. Even the bolts are here – is it just me or does the HTC Aria look cooler without the battery cover? Anyway, what sets them apart is the OS – one has aging WinMo to cover under the wraps of Sense UI, the other has Android 2.1 Eclair with the droid version of Sense. That’s the one we’ve got right here. We’re just starting to play with the Aria and we’ll report back with a full review soon. Our video team is still discussing the script and plot twists, but as soon as they’re done we’ll post a hands-on video of HTC Aria here in the blog as well. Update: Here’s the video as promised. It took a bit longer than expected, but it’s finally here. The HTC Aria uses the same CPU as the HTC Legend and seems quite snappy in those Android affairs. Looking nice so far.